Both Spurrier and the Center for Innovation’s medical director, Doug Wood, M.D., were on hand at the event last month to accept the Destination Imagination 2014 Risorgimento Award on behalf of Mayo Clinic. They also used their time on stage to promote a challenge of their own to the more than 200,000 kids who participate in Destination Imagination challenges each year. And, of course, they did so in style. During his acceptance speech, Dr. Wood thanked Destination Imagination for the award, and said there’s still a lot of work left to do in making the world a healthier place. “We’ll need some superheroes,” he said, to help Mayo do that work, one community at a time. That was Spurrier’s cue. “So I then went out on stage dressed as ‘Captain America,’ grabbed the microphone, and shared the challenge,” she says. 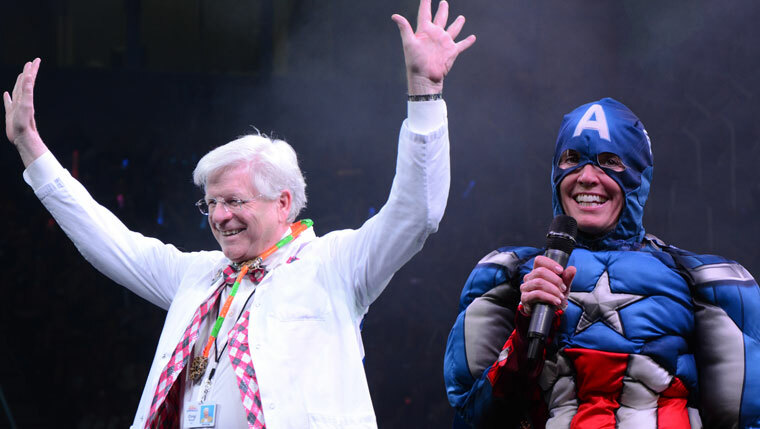 Spurrier and Dr. Wood say Mayo and Destination Imagination’s summer-long Unlikely Superheroes challenge largely revolves around how we can better use young people as “catalysts” to improve the health of our communities. And regardless of what solutions the kids come up with, Nina Schwenk, M.D., a long-time Destination Imagination board member, says simply having the opportunity to “put Mayo in front of a much younger generation “ through a challenge that helps them “marry science technology with creativity” while also teaching them how to work in teams to solve problems in a “need-base structure” is what excites her most. The team that wins the Unlikely Superheroes challenge will get to present its solutions on-stage during the 2014 TRANSFORM Symposium, Sept. 7-9. Read more about Destination Imagination here, and watch a video of Spurrier and Dr. Wood accepting Mayo’s award here. Then, be sure to let us know what you think about this story and others by sharing your comments below. While you’re here, share this story with others using the handy sharing tools atop the page.